CRM’s are marketed as a sure fire way to boost sales, drive engagement and increase profitability. But in reality their job is to enable your business to create and nurture long lasting client relationships and enable you to make better strategic decisions in the future. According to Gartner, CRM software was predicted to be the fastest growing software market in 2018. In 2017 alone, worldwide CRM software revenue amounted to $39.5 billion. With companies spending such vast amounts of money, then it is more important than ever to ensure that your CRM is generating a return on your investment. 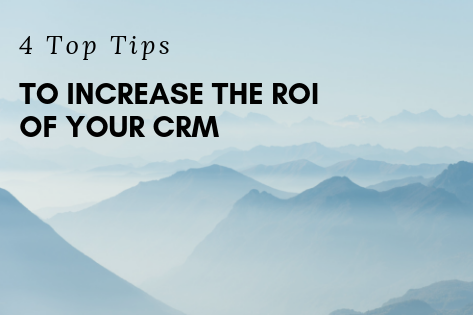 There are several factors involved in ensuring that your CRM is doing its job and by looking at each of these in turn you can better understand how you can increase the ROI of your CRM. Most out of the box solutions won’t be perfectly tailored to your business and so being able to bolt on additional functionality is key. Finding a CRM that meets the majority of your business needs but also has a suite of optional integrations is crucial. The more you can configure your CRM to make your team’s job easier, the better the chance of it being used. According to a recent HubSpot’s report, over 20% of sales professionals cite manual data entry as their top CRM challenge. The main purpose of a CRM is to aggregate your business data and save your team time, not hinder it by asking users to spend half their day updating the CRM. CRM automation tools can be used to automate common tasks, remove reliance on individuals and eliminate data input errors. Low CRM adoption is another common issue when considering whether to invest in a CRM. If no-one is actually using the software then you can’t expect to see a decent ROI. The key is to operate a top-down policy. If the senior management are seen to be actively using and encouraging their team to use the CRM then there is a higher chance of achieving the desired ROI. Regular training can also help as without this users are often not aware of many of the features that can make their life easier. It’s widely known that businesses that run transparently are more likely to succeed. Companies such as Stripe and Buffer have long evangelised over the benefits of operating a transparent culture. This is also true for CRM software. Often different divisions of a business have limited or no visibility as to what is going on in another area of the business. Take for example, a team member in sales who has no access to their marketing colleagues work or the customer support team. How can you know how best to deal with a customer when you can’t see the full picture? Data transparency can radically improve your decision making and ensuring your CRM is capturing the right data is essential.